Reading this in your email? For easier reading - Click here! Today’s blog is written by a guest blogger and master carpenter, Luke Larson. I was standing in the spacious interior of a beautiful and well-kept barn dating from the 1780s. “Is that so?” I asked, and the gentleman continued his story. Prohibition lasted in the United States from 1920 until 1933. The manufacture and sale of alcohol was prohibited, which gave rise to a healthy black market with whiskey runners smuggling alcohol south from Canada. As the story goes, friends of the barn owner were involved in this trade and the authorities were hot on their tail. They sped a car full of liquor into the wide eve door of the barn and quickly threw hay down from the loft to conceal the vehicle and its clandestine contents. Unfortunately for my friend’s family, the cops discovered the car under the hay and the owner of the barn (this man’s grandfather) spent time in prison. But year’s later the barn still stands, remembering those decades ago when it was used to smuggle liquor to Vermonters thirsting for the hard stuff! 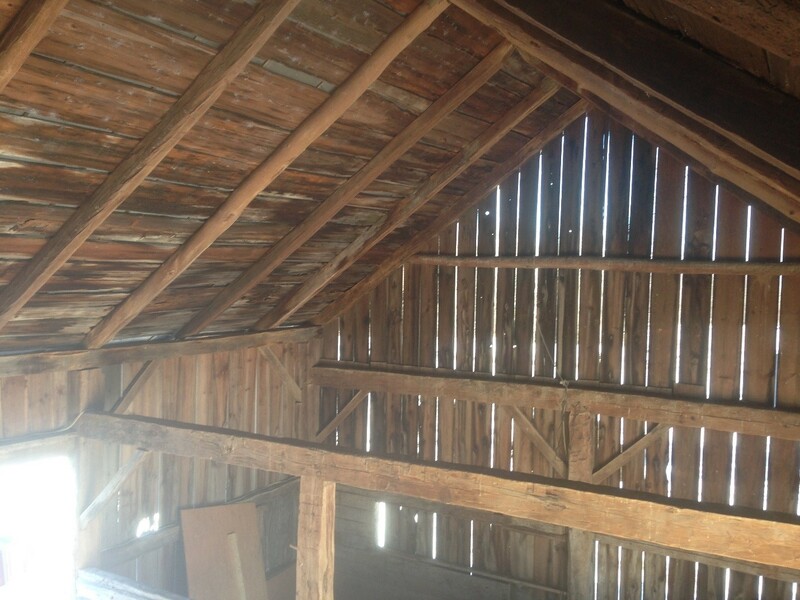 Below is an interior photo of the Prohibition Barn. This would make an incredible loft living space! Imagine the hay being hurriedly cast down from this loft to cover the contraband almost 100 years ago! The Prohibition Barn was the second barn I was to visit on the island. The first barn, on my trip up north, was the Hero Barn and the two barns had a lot in common. Both barns date from the time of the heroes for whom the Island was named: Green Mountain Boys, Ethan Allen and Ira Allen, among others. 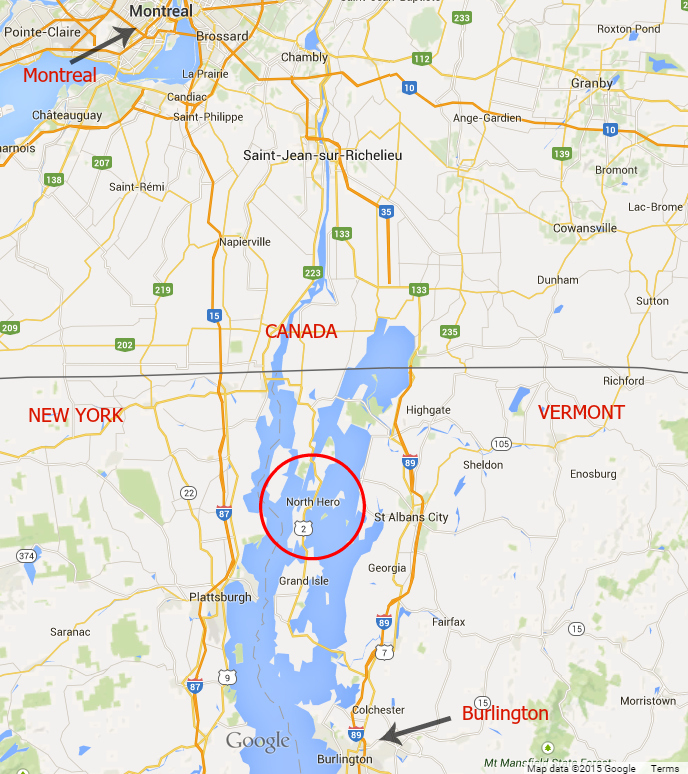 Incredibly, both barns are twenty-six feet wide by thirty-six feet long, and both have hand hewn chestnut braces. While it was common in that era to build barns with hand hewn vertical and horizontal timbers, I have come across only one other barn in my work where even the diagonal braces were hewn. It is a good clue as to the very early construction of these barns, and makes me wonder if both might have had the same builder. I love the stories that barns can tell, and all the history engraved in them. The gunstock Hero Barn, a few miles south from the Prohibition Barn, has the skeleton of a very early log cabin just feet from the barn. As settlers moved north, they would have quickly erected a structure to live in while constructing the rest of the buildings. 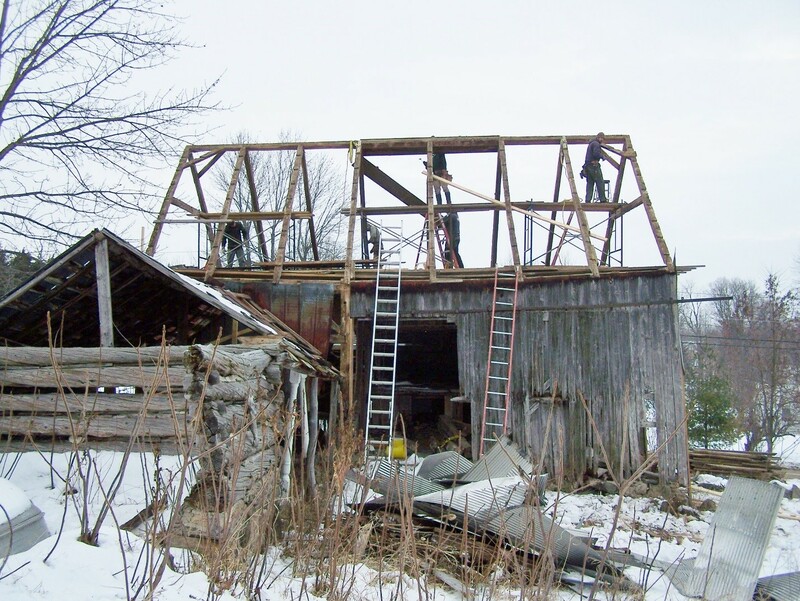 It was the middle of December as a great crew and I carefully disassembled this barn frame, and I quickly understood why the original dwelling was only feet from the animal barn with a covered passage between the two! Oh, the wind it was a blowin’! 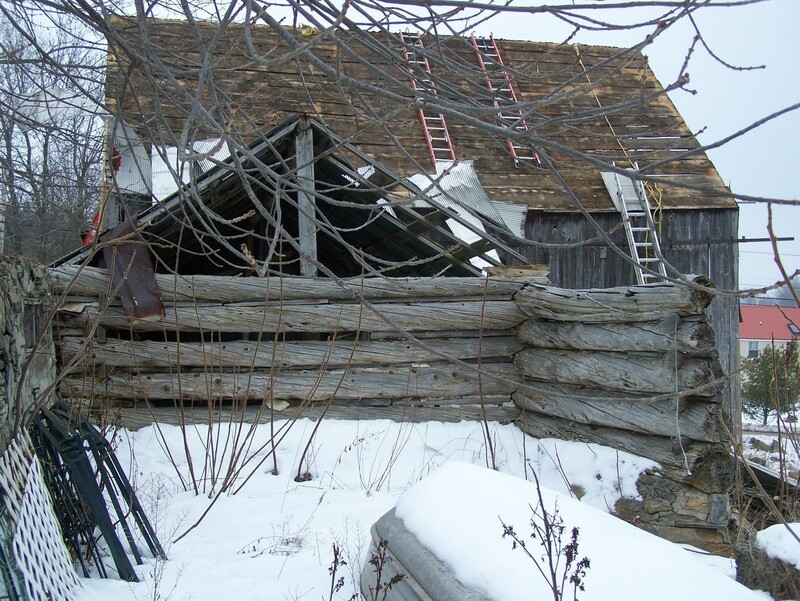 Here is a photo of the collapsed log house, with the barn behind it. This Hero Barn, which I now have in stock, is a gunstock frame made with oak and American chestnut. The term “gunstock” refers to the solid oak posts which flare at the top, providing more strong wood for joinery. 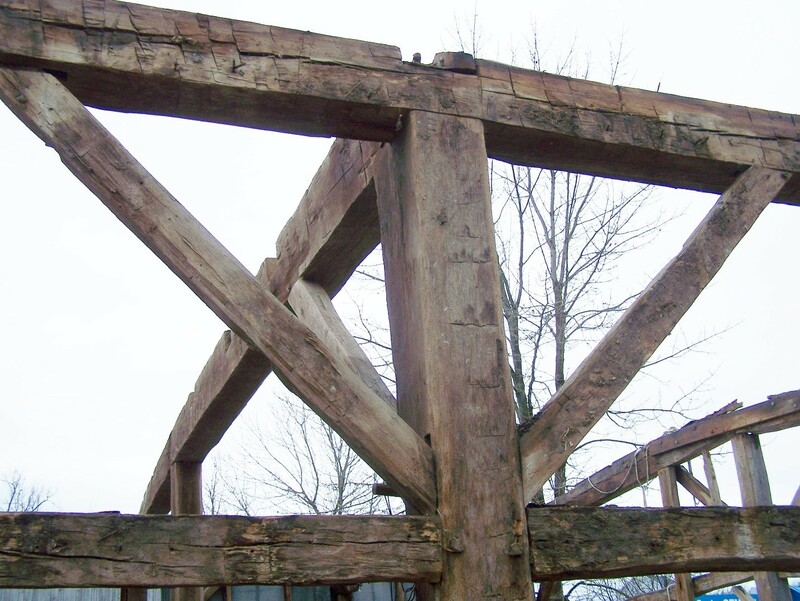 This barn has a ridge beam, which is a thirty six foot American chestnut beam in perfect condition. 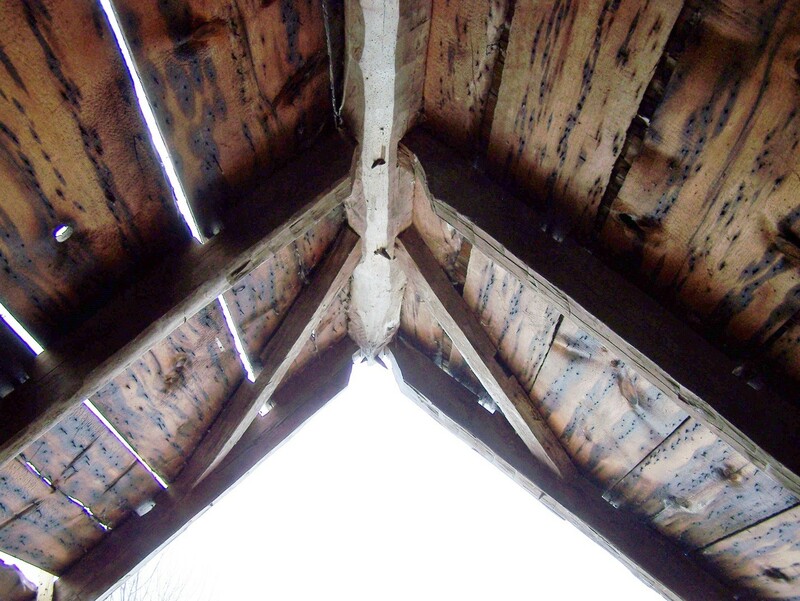 Notice how the gable rafters are braced to the ridge beam. 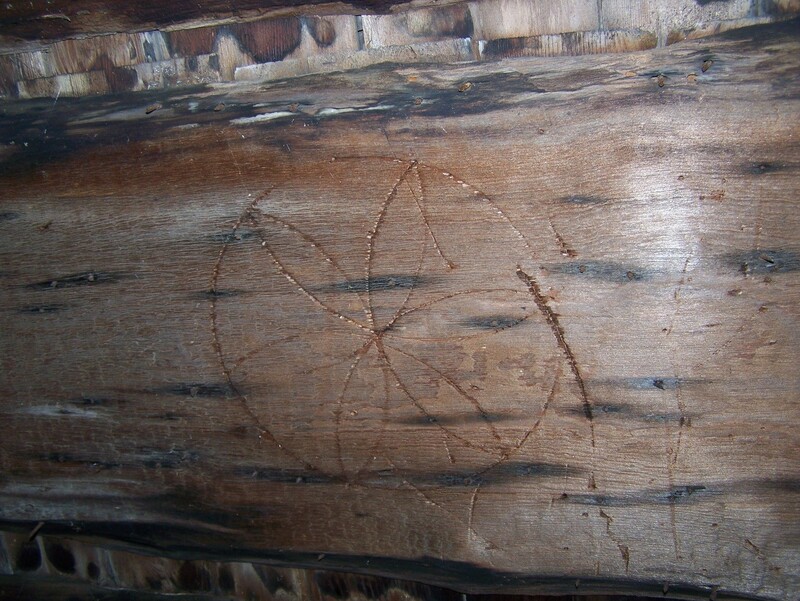 Below is a classic “signature” of the builders, a daisy wheel displayed top center on the roof boards. Elsewhere on this blog, you can read about the purposes of these daisy wheels. Notice that you can see the original cedar roof through the gap between the boards. The cedar was later covered with metal roofing. The photo below shows the gunstock posts and strong chestnut girts. The far post in the photo has rot on the top. I have now acquired another hewn oak gunstock post which I will use for the repair. 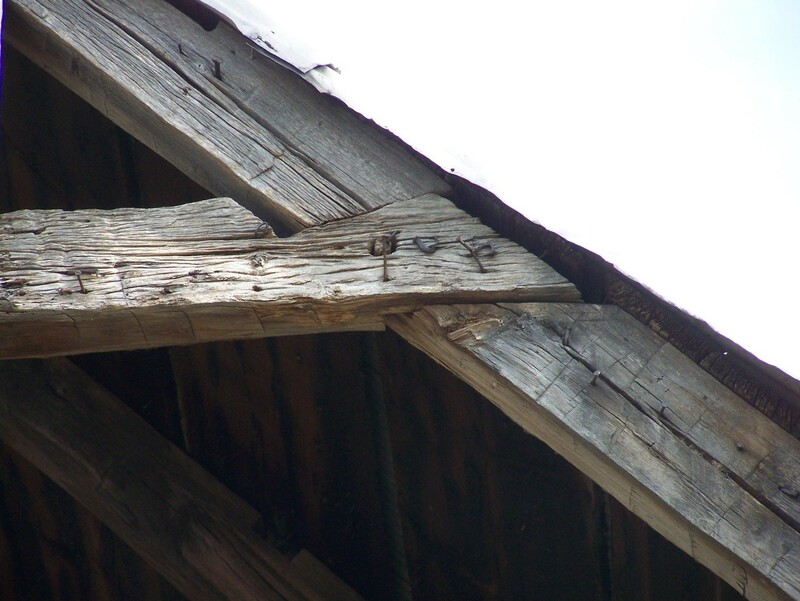 Below is the weathered but strong collar tie on a gable rafter pair. The quality of joinery on this barn speaks to me of heroes perhaps less well known than the Allen boys, who put such quality craftsmanship into these two barns on the island. After careful washing and restoration, this barn will be ready to tell its stories to a new family, and even begin to absorb new tales into its weathered and long history. A tremendous thanks to Luke of Larson Carpentry for sharing this with us! 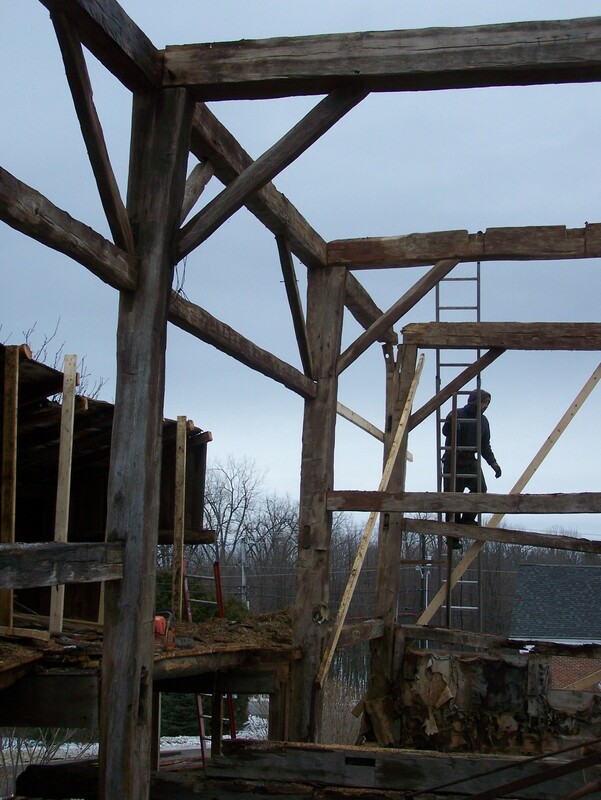 Contact Green Mountain Timber Frames if you are interested in learning more about either the Prohibition Barn Frame or the Hero Barn! 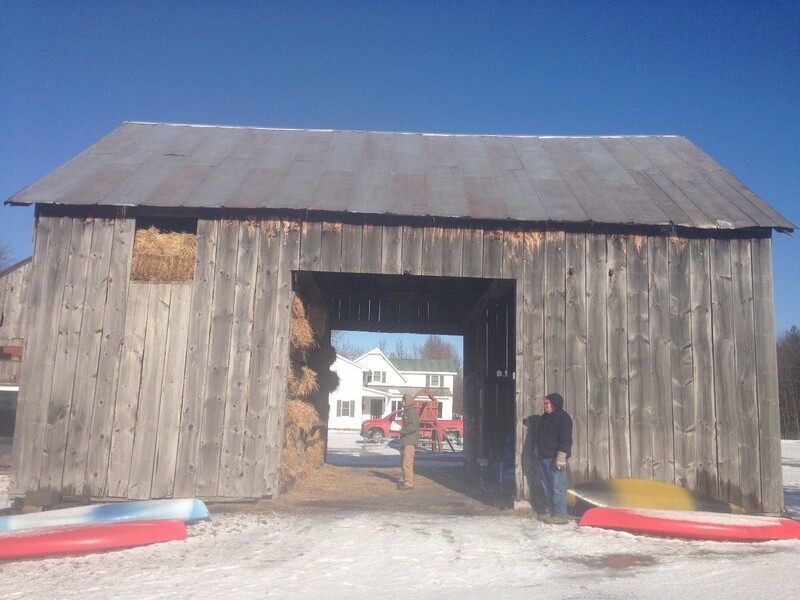 You can read another guest post from Luke when he shared with us the details of a Gambrel barn home in Danby, Vermont. This entry was posted in Uncategorized and tagged American Architecture, American Revolution, available barn frames, barn homes, prohibition, timber frame homes by Green Mountain Timber Frames. Bookmark the permalink.